This was King Crimson’s second album. Greg Lake continued to provide vocals here (with the exception of one song), although he had left the band. This isn’t as strong in some ways as the debut. It also is often pretty derivative of that work. Still, there are some shining moments of brilliance here. This just seems a little harder to latch onto sometimes. 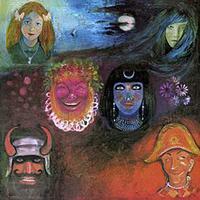 King Crimson’s first album started with the nearly heavy metal bombast of “21st Century Schizoid Man.” With their second album, they moved just about as far from that as they could. This is an extremely mellow and short piece. It’s very much like a sedate classical vocal treatment. Now, the opening theme on this does call to mind “…Schizoid…” From there, though, we’re taken into a full on jazz treatment. Sure, it’s still rather heavy, but it’s jazz. When the vocals join, this feels like a combination of King Crimson and Emerson, Lake and Palmer. Of course, since Greg Lake was part of Emerson, Lake and Palmer by the time he was recording this tune, it makes sense. The jazz jam returns after the vocal segment, serving as the break between those vocal segments. It gets pretty intense as it builds out from the second vocal movement. Then a new, frantic jam emerges and the piece just keeps shifting and turning. A later fast paced jam has definite connections “…Schizoid…” It drops to weird spacey sparse elements for a time. Then it eventually works its way back to the song proper before dissolving into weird, noisy jamming to end. This is another short and gentle tune. It’s neither as short or as gentle as the opener was, though. This is the only song on the disc to be sung by Gordon Haskell. It’s pretty and restful. This feels almost like it jumps right into the middle of the song. A powerful musical theme creates the introduction. As it drops back for Lake’s vocal, this feels again like a cross between Crimson and ELP. It’s familiar and yet fresh. This piece is powerful and calls to mind some of the best stuff from the first Crimson album. In fact, this has a lot in common with the “title track” to that first album. It definitely borrows from it and/or expands upon it. This is an instrumental version of the same themes that opened the disc. It’s a short cut, but not as sedate as that first song was. A jazzy cut, this is another that has a lot in common with ELP. It’s got some frantically crazed piano work. It’s a cool rocking tune, though. I love the bass line. The lyrics are bizarre, but the vocal line rocks. This instrumental is an epic piece (eleven and a half minutes) in three movements. It rises up gradually in a mellow, but quite lush arrangement. Despite being fairly mellow, it’s bombastic. There are definitely elements of “Mars” by Holst. It gets a little creepy in the more powerful sections. There is an otherworldy element to it for sure. A crescendo gives way to a dark and ominous section. It grows outward from there by combining that with the previous elements. It gets quite noisy and chaotic before the sounds of intense winds take over. There is a false ending that gives way to a symphonic, orchestral sort of rock movement. It gets dissonant and chaotic. Jazz sounds combine with weird rock and more. Some of this feels quite freeform. As this gets noisier and crazier some bits from the first album are heard. This dissolves into weirdness, moving away towards a mellower sound. Some pretty acoustic guitar takes it right at the end. Starting acapella, this is mellow and has a great melody. It’s over half a minute in before any instruments are added. Acoustic guitar joins along with other voices. This is very much a folk rock meets psychedelic piece.